It’s day one of NAMM 2019, and music gear companies from all over have flooded the Anaheim Convention Center to unveil what’s new from them this year. Among the first companies to drop new units of hardware is none other than PreSonus, which has a whopping 5 new interfaces to display to the public. All 5 of these interfaces are new additions to the “Studio Series” line, and bring USB-C compatibility, a 192 kHz sample rate, and other big updates to their earlier versions. 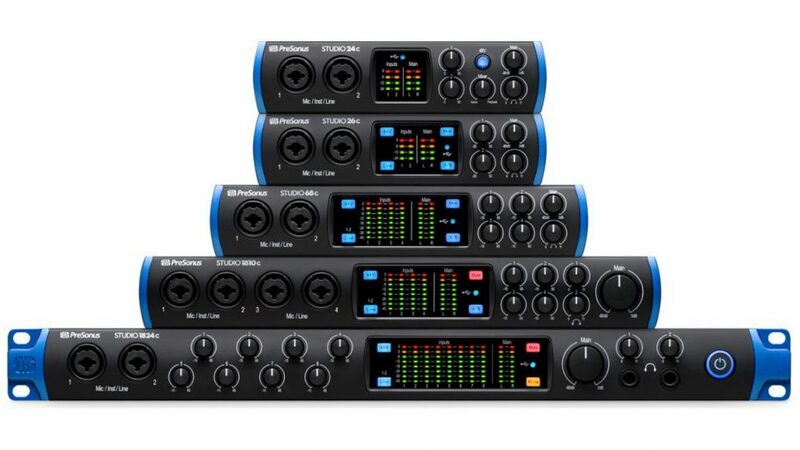 New interfaces include the PreSonus Studio 24c, Studio 26c, Studio 68c, Studio 1810c, and Studio 1824c. Here’s everything you need to know about them. The smallest of the five models, the PreSonus Studio 24c is ideal for musicians who do a lot of home recording, podcasters, and live streamers. It sports two front-facing combo mic/line/instrument inputs, and two line outputs on the back. Each input is also equipped with PreSonus XMAX-L preamps to bring microphones up to line-level without losing any tonal integrity. The device also comes with MIDI I/O, which is great news for those that might want to dive into electronic music or virtual instruments. The PreSonus Studio 24c comes at $149.95. The PreSonus Studio 26c is a slight upgrade from the 24c, in that it provides an additional two line outputs on the back end. An added Cue Mix A/B button on the front allows users to switch between which output cue mix they are sending out. Also included is a Monitor button and a Line selector, to select the input type. This option is ideal for DJs or musicians on the go, who need an extra pair of outputs, but are not willing to sacrifice portability for it. The PreSonus Studio 26c $199.95. Coming in at number three is the PreSonus Studio 68c. This interface is equipped with six inputs and six outputs — the inputs come in the form of four combo inputs (two in front, two in back, equipped with XMAX-L preamps), and two S/PDIF inputs. The outputs of the 68c are all line outs. This model also comes with the Cue Mix A/B button, Monitor button, and Line selector as well. This interface is best for those with small bands who need to record a quick demo together and small home recording studios — and will come at a price of $299.95. Taking a big leap from small to large environment essentials, the PreSonus Studio 1810c is equipped to record up to 18 simultaneous inputs, with eight available outs. It comes with four XLR inputs equipped with XMAX-L preamps, with the rest set up for a combination of line and S/PDIF inputs. This is the first model among the new 2019 series to also include a Mute button along with the others. This one is best for those in studio environments who need the additional inputs for larger recording sessions, and bands who need flexibility when recording themselves. The Studio 1810c will run you about $399.95 as a whole. As a whole, all of these new interfaces that were announced from PreSonus at the start of NAMM 2019 seem very appealing and exciting, as they all offer new features from the previous models, including USB-C compatibility which seems to be turning into a new standard of today’s interfaces. We can’t wait to hear what the company has in store for us during the rest of the weekend, and we’ll be sure to let you know as soon as we do.